Have enjoyed Gold Blend for many many years. The current product can at best be fit for the rubbish bin. If you want tasteless sludge you are welcome to it. Sorry Nestle, your loss, now enjoying a delicious cup of Douwe Egberts Expresso. Proper Coffee.... Shame on the people responsible for this rubbish. Does not deserve any stars at all. Totally agree with you, why change something that people have enjoyed for years. I do not like the new Gold Blend and at first I thought they had just changed the jar but after tasting it no! it has changed but certainly not for the better. It leaves muddy tasting water in the bottom of your cup. I trail round all the Poundstretcher, B & M's type shops for the old style jars of Gold Blend if they have them. Sooner or later they will run out. Cannot believe Nescafe haven't got the message by now. Returned ALL our stock back to Tesco's. Use Motorhome so stock that and home. Rubbish after years of enjoyment. Which country was it trialled in? We know from experience that the Gold Blend in France is different. They take years to build a reputation. Lost it completely and it will take massive marketing to retrieve. Some hopes. Competitors take note! 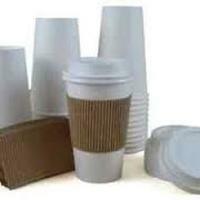 Paper Hot Cups by Sugarman Creations 1.